← 7-minute rap video: Is there a ‘New World Order’? Given the presumed 17% expansion of the global economy since 2009, the tiny increases in production could not possibly flood the world in oil unless demand has cratered. 2. The event has a major effect. 3. After the first recorded instance of the event, it is rationalized by hindsight, as if it could have been expected; that is, the relevant data were available but unaccounted for in risk mitigation programs. 1. How many analysts/pundits predicted the 37% decline in the price of oil, from $105/barrel in July to $66/barrel at the end of November? Perhaps somebody predicted a 37% drop in oil in the span of five months, but if so, I haven’t run across their prediction. For context, here is a chart of crude oil from 2010 to the present. Note that price has crashed through the support that held through the many crises of the past four years. The conclusion that this reflects a global decline in demand that characterizes recessions is undeniable. I think we can fairly conclude that this free-fall in the price of oil qualifies as an outlier outside the realm of regular expectations, unpredicted and unpredictable. Why was it unpredictable? 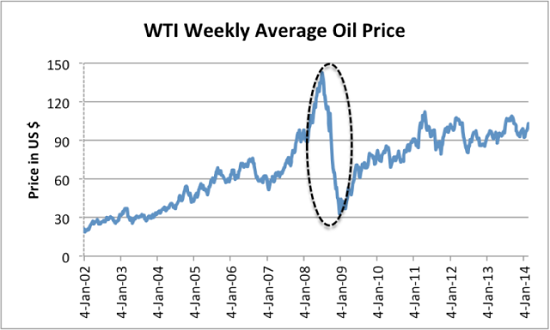 In the past, oil spikes tipped the global economy into recession. This is visible in this chart of oil since 2002; the 100+% spike in oil from $70+/barrel to $140+/barrel in a matter of months helped push the global economy into recession. The mechanism is common-sense: every additional dollar that must be spent on energy is taken away from spending on other goods and services. As consumption tanks, over-extended borrowers and lenders implode, “risk-on” borrowing and speculation dry up and the economy slides into recession. But the current global recession did not result from an oil spike. Indeed, oil prices have been trading in a narrow band for several years, as we can see in this chart from the Energy Information Agency (EIA) of the U.S. government. Given the official denial that the global economy is recessionary, it is not surprising that the free-fall in oil surprised the official class of analysts and pundits. Since declaring the global economy is in recession is sacrilege, it was impossible for conventional analysts/pundits to foresee a 37% drop in oil in a few months. As for the drop in oil having a major impact: we have barely begun to feel the full consequences. But even the initial impact–the domino-like collapse of the commodity complex–qualifies. I will address the financial impacts tomorrow, but rest assured these may well dwarf the collapse of the commodity complex. As for concocting explanations and rationalizations after the fact, consider the shaky factual foundations of the current raft of rationalizations. The primary explanation for the free-fall in oil is rising production has created a temporary oversupply of oil: the world is awash in crude oil because producers have jacked up production so much. The EIA estimates the global economy expanded by an average of 2.7% every year in this time frame. Thus we can estimate in a back-of-the-envelope fashion that oil consumption and production might rise in parallel with the global economy. Global petroleum and other liquids reflects a similar modest expansion: from 89.1 MBD in 2012 to 91.4 MBD in 2014. Given the presumed 17% to 20+% expansion of the global economy since 2009, the small increases in production could not possibly flood the world in oil unless demand has cratered. The “we’re pumping so much oil” rationalizations for the 37% free-fall in oil don’t hold up. That leaves a sharp drop in demand and the rats fleeing the sinking ship exit from “risk-on” trades as the only explanations left. We will discuss these later in the week. I call your attention to the last line, which I see as being most relevant to the full impact of oil’s free-fall. a mere $9.95 for the Kindle ebook edition and $15.47 for the print edition. This entry was posted in General and tagged Black Swan, consumption, crude oil, global recession, Nassim Taleb, oil, production, Smith Uncertainty Principle. Bookmark the permalink.